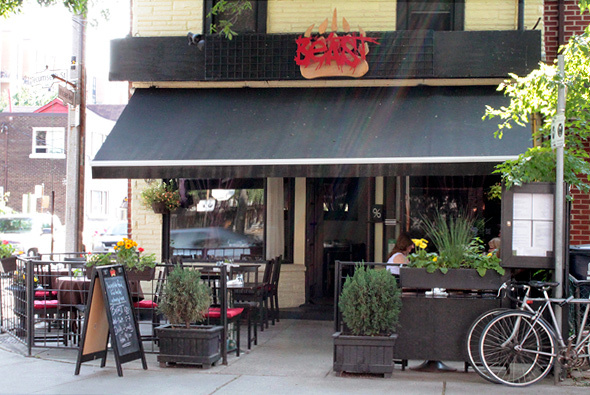 Beast is tucked away at 96 Tecumseth, just North of King and West of Bathurst, on a quiet tree-lined residential street with ample shaded patio seating to cool off on a hot humid summer evening. Being the first of the month and nearly broke from rent, I hit up their Beast 120, a discounted tasting menu offered Wednesday to Saturday from 5-7pm; hence the 120 since it's two hours. I recently discovered Toronto is to 'happy hour' as the town in Footloose is to dancing -- apparently, there's some backwards city ordinance outlawing the phrase since '84. But I digress. Beast patronizes local suppliers who utilize sustainable practices. With glasses of wine at $5, domestic beer at $4, and tapas starting at $2, I'm releasing my inner gourmand savage while sparing my wallet any harm. Their inventive poutine ($4) consisted of fried gnocchi, mushroom ragu, and of course squeaky curds. A playful combination that sadly missed the holiest ingredient in the poutine trinity, a velouteÂ´ gravy. I found the ragu too thin to coat the starch of the potato gnocchi but overall a well executed dish. 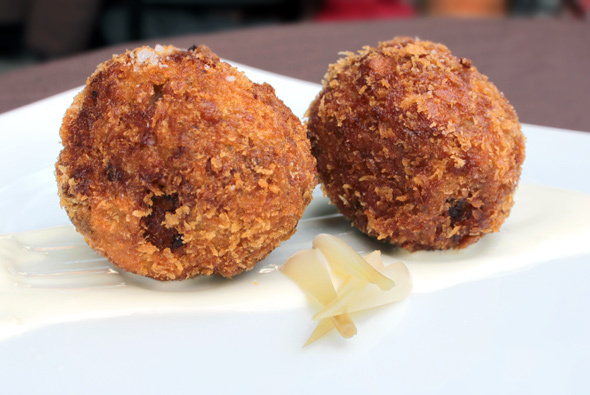 The "dirty" rice balls over housemade ranch dressing were surprisingly rich largely due to the chicken livers incorporated into the rice which elevated it to a creamy risotto consistency. A real winner with the clean finish of the Flat Rock Chardonnay ($5). I kept this winning streak by ordering the PEI Malpeque Oysters ($2 each). 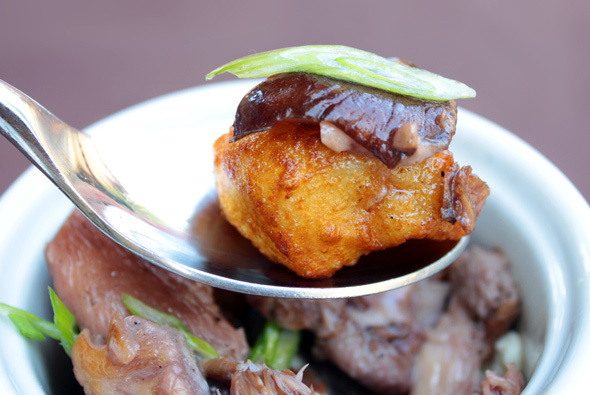 The buttery and mellow flavor of the meat was brightened with the simple shallot mignonette. Not exactly reinventing the wheel, but tried and true flavors that resulted in a solid summer amuse-bouche. Lamb ribs ($4) were drenched in a South Carolina barbeque sauce so sticky and tangy I hardly tasted any gaminess from the lamb. My only hesitation was that my rib was more fat than meat. Embarrassingly, I found myself gnawing the little meat I did find off the bone. I guess those actions speak louder than these words. I washed it down with the Stratus Tollgate ($5), a versatile yet delicate table red. For dessert, we opted for the Tres Leches cake ($4) and the coconut chili ice cream ($3 a scoop; not part of 120). The Tres Leches cake was muy delicioso. 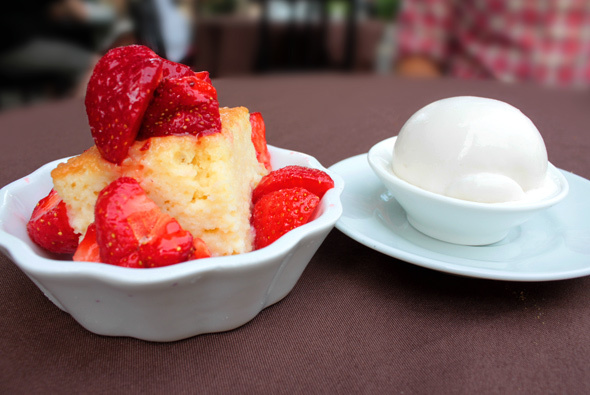 Dense yet spongy, the absence of dulce du leches was not missed. By far, the ice cream was my favorite dish on this hot summer night. With the addition of chili, the coconut coerced the tongue while the capsaicin of the chili hit the back of our throats; a wonderful dichotomy of flavors that simultaneously worked and soothed our palate. In marketing, happy... er...120 is usually categorized as a loss leader in hopes an establishment will boost revenue by creating an artificial demand at an otherwise slow time. I'm sure Beast will have no problem with this tactic since it's far and few in this city. It's also an economical way to explore a new restaurant. If this is a taste of what's to come, I can't wait till the 15th when I can return and order off the full menu.